If you have a good sense of humor and like working smart, you will love this viral report! If you are not willing to pay a professional copywriter thousands of dollars to write a viral report, you will love this viral report that is written by a professional copywriter and he charges thousands of dollars for writing a viral report! If you are sick and tired of working hard in a boring job that is draining your life away, you'll definitely want to share this viral report with as many people as possible! Share this report with Eagles, the Ducks and Chickens will probably think this is too good to be true and will give you many reasons why they can't do it. To be successful in this business you must understand that birds of a feather like to flock together, and it is very important that you speak to the right group of people. Eagles are people who have a positive attitude and are open to possibilities and great opportunities. They have good character and leadership and they like to help people to live a better life. They see the value and not the price. Ducks are people who have a negative attitude and are always complaining and focusing on negative things. They have all the excuses on why they can't do what the successful people are doing. They are very good at justifying and blaming others for their poor results. Chickens are people who are held back by fears, doubts and skepticism. They talk a lot but do very little. Many of them belong to the NATO Club, No Action, Talk Only Club! They will discourage their friends from living their dreams out of the fear of losing their friends. Network marketing is very powerful with the integration of internet marketing. You get to leverage the best of both worlds, high touch and high tech. I want to pass on my 25 years of network marketing and 19 years of internet marketing knowledge and experience to people who want to learn how to earn $2,000 to $10,000 or more a month in this wonderful business of people helping people to live a better life! 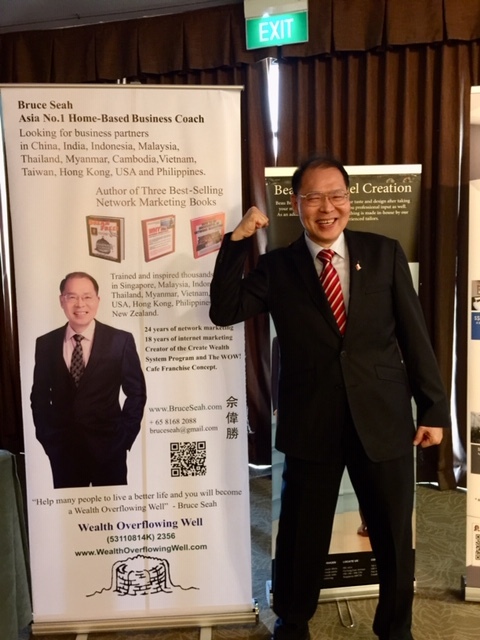 I've invested over $100,000 to learn million-dollar lessons on business and life from many successful multi-millionaire entrepreneurs such as Robert Kiyosaki, Jay Abraham, Tony Robbins and Mark Victor Hansen! My smart marketing strategy is to attract smart people who want to work smart and want to learn million-dollar lessons on business and life from me for free! I've created a simple and duplicatable program that can help you earn $56.95 to $569.50 or more a day! It all depends on your level of commitment of time and consistent effort! We live in the real world and we know many people do not believe they can earn $569.50 a day! So if you belong to this group, let's just focus on earning $56.95 a day part-time! 56.95 x 30 days = $1,708.50. Can you think of the things you want to buy with an extra $1,708.50 a month. What if you only earn $1,000 a month, that's $12,000 a year, can you bring your family for a great holiday with $12,000? Having been in this business for 25 years I know that tens of thousands are happily earning $300 to $1,000 or more a month. People will continue to stay in this business if they are earning $300 to $1,000 a month. Why? It is because they want to continue to enjoy free products and extra money every month, that is the essence of the business, working smart, enjoying free products and extra money every month! Over 97% in this business are part-timers or loyal customers who love the prroducts! Tens of thousands are happy to earn $300 to $1,000 a month or a few thousand a month. It is the business builders who want to earn $10,000 or more a month, and they are less than 3% of the distributors in this industry. I do not simply pluck these figures from the air, if you know network marketing leaders who have 10 years or more of experience, they will agree with what I'm sharing with you. So here is the simple plan, it is very easy for your prospect to make a very small one-time investment of $336 only in a health supplement package! It is a very easy decision when they compare it to packages that cost $3,000 to $4,000 or more! In marketing, it is never the price, it is always the value. For such a very small one-time investment, you get a proprietary "Think Out Of The Box" program, 2 hours a week, a $10,000 value, for free! For those who are slow learners, you can continue for another 6 months for free! That means you have one full year to learn as much as possible from a master network marketer with 25 years of knowledge and experience! I believe my knowledge and experience are worth millions and my simple strategy is to attract smart people who can appreciate great value! In this special program you will learn how to earn $2,000 to $10,000 a month in 6 months and learn many million-dollar lessons on business and life for free! It is easy for a person to decide to invest $336 in a health supplement package when they know they can earn $2,000 to $10,000 a month in 6 months! We will show you exactly how you can earn $2,000 to $10,000 a month when you seriously work the business! When you work the system, the system will work for you, I personally can guarantee you that! Whenever a person decides to invest in a $336 health supplement package, you will get rewarded with a fast-start commission of $56.95 and if you live in Singapore, it will be deposited into your bank account in 3 working days! Yes, you can earn money fast! Always work with the law of averages to guarantee your success! Keep on sharing this viral report with as many people as possible! Some will, some won't, next! This viral report will go viral because it offers a great opportunity to leverage a multi-million-dollar company with 25 offices and operations in over 90 countries! You get all of the above with a very small one-time investment in a health supplement package of $336 only! When you divide it by 365 days, it is only 92 cents a day!